Simple words and real-life examples teach assertiveness, responsibility, relationship skills, choice making, problem solving, goal setting, anger management, and more. Gershen Kaufman was educated at Columbia University and received his Ph.D. in clinical psychology from the University of Rochester. Professor in the Counseling Center and Psychology Department at Michigan State University, he is the author of Shame: The Power of Caring and The Psychology of Shame: Theory and Treatment of Shame-Based Syndromes. He is the coauthor with Lev Raphael of Dynamics of Power: Fighting Shame and Building Self-Esteem and Coming Out of Shame. Lev Raphael was educated at Fordham University and received his M.F.A. in Creative Writing from the University of Massachusetts at Amherst. He holds a Ph.D. in American Studies from Michigan State University, where he has taught as an assistant professor of American Thought and Language. 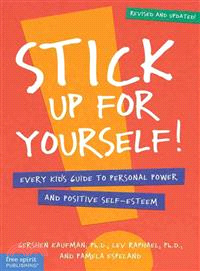 With Gershen Kaufman, he codeveloped and cotaught the program, “Affect and Self-Esteem,” on which the books Dynamics of Power and Stick Up for Yourself! are based. Book critic for National Public Radio’s “The Todd Mundt Show” and “Mysteries” columnist for The Detroit Free Press, he is the author of three Nick Hoffman mysteries, most recently The Death of a Constant Lover. Pamela Espeland has authored, coauthored, or edited over 200 books for Free Spirit Publishing on a variety of subjects. Pamela graduated from Carleton College in Northfield, Minnesota and currently lives in Minneapolis with her husband and two little dogs.